Unfold the pastry on a lightly floured surface. Roll the pastry into a 12-inch square. Brush the pastry with the egg mixture. Stir the pecans, sugar and cinnamon in a small bowl. Sprinkle the pecan mixture over half of the pastry. Fold the other pastry half over the pecan filling. Slide the pastry onto a baking sheet and refrigerate for 30 minutes or until the pastry is firm. Roll the chilled pastry on a lightly floured surface into a 12-inch square. Using a sharp knife or fluted pastry wheel, cut the dough crosswise into 24 (1/2-inch wide) strips. Twist the strips and place them 2 inches apart, on the prepared baking sheets, pressing down the ends. 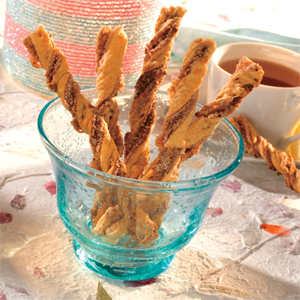 Refrigerate the twists for 1 hour. 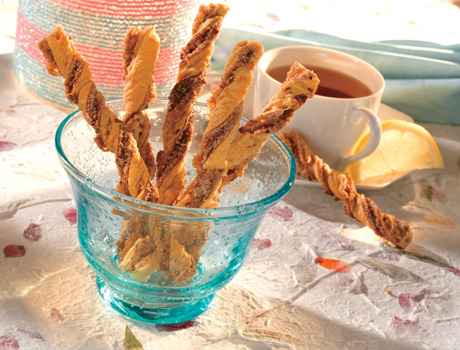 Bake the pastry twists for 20 minutes or until they're golden brown. Let them cool on a wire rack for 5 minutes.